Alterian recently released some data on the most popular summer blockbusters in social media, focusing specifically on movies with May and June release dates. Apparently much of the discussion of Fast Five was generated by Vin Diesel’s Facebook page, showing the value of star power and a loyal fan base in any endeavor. The Vin Diesel Facebook page has more than 24,000,000 likes. 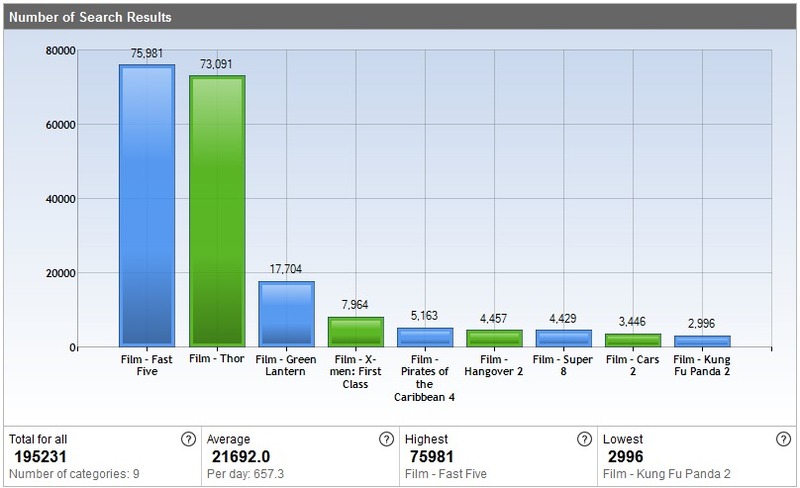 At the other end of the spectrum, in Alterian’s sentiment analysis two summer movies had more negative opinions than positive: Green Lantern and The Hangover Part II. It will be interesting to see if early negative reactions translate into poor performance at the box office. Does the Alterian data match what is available through some of the free tools out there? 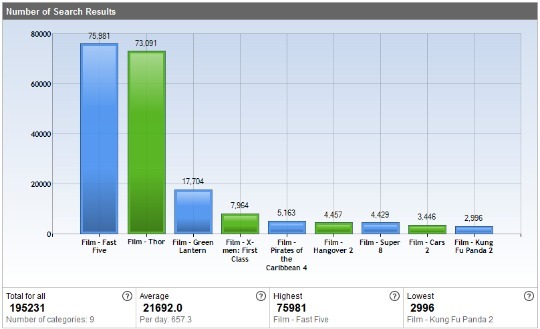 Social Mention’s strength and reach scores are fairly similar for all four films so there is not much separation for Fast Give and Thor in its data. In terms of sentiment analysis, Green Lantern actually has the best ratio of positive mentions (8:1) in its dataset. Hangover 2 was omitted because a maximum of three terms can be compared with the Topsy tool. Thanks for citing Alterian’s research in your blog post! We are actually going to be analyzing the movies all summer and releasing the results during 3 webinars. I’m very excited about this analysis (I’m a sucker for a good Superhero movie). Our first analysis included May and June releases. In September we are planning on releasing all of the results and comparing the social data against the box office results to see what correlations we find. Thanks for the additional information Elyse, it sounds like a fun project. It will be interesting to see how the social media data correlates with box office results.